At Colonial Heights Animal Hospital, we are committed to owner satisfaction by offering high quality, personalized veterinary care. 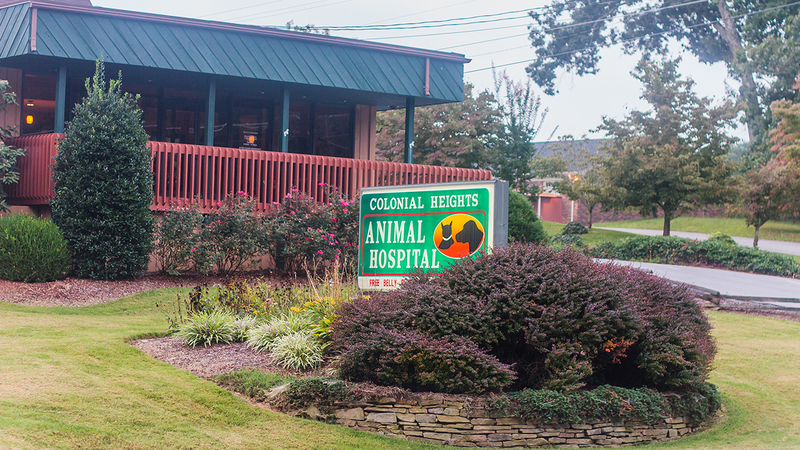 The goal of the staff of Colonial Heights Animal Hospital is to advance the health of the pet through owner education, preventative care, and a progressive, compassionate approach for both pet and owner. 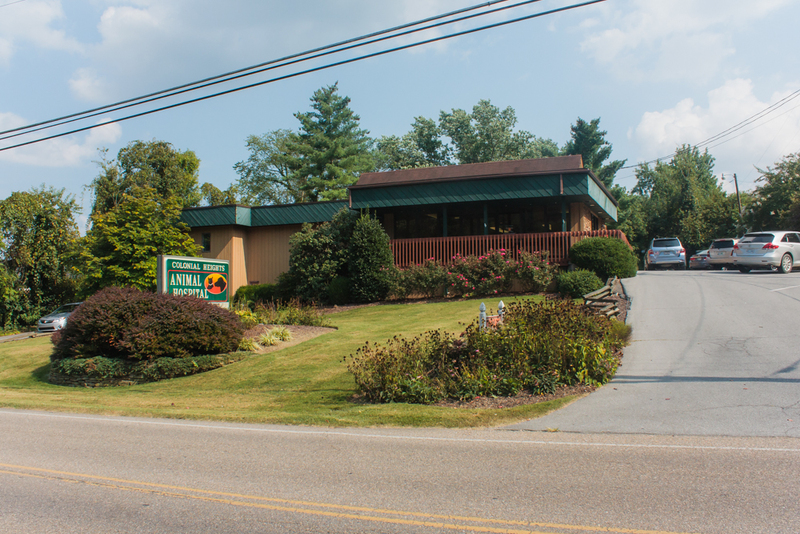 Colonial Heights Animal Hospital was founded in 1972. We currently have twelve employees. We pride ourselves in striving to promote in-depth diagnostic care for our patients and utilizing the advice of consultants in medicine, opthalmology, radiography and surgery via telephone consultations and telemedicine. We place a great deal of emphasis on client service and education about our pets’ needs. Preventative medicine and dentistry are stressed at our clinic. Our office is conveniently located just off Fort Henry Drive in Colonial Heights. Go to the intersection of Fort Henry Drive and Colonial Heights/Lebanon Road. Turn on Colonial Heights Road (toward Warriors Path Park), the hospital is located on the Right about 1/10 of a mile. We have used CHAH since 1973 for all of or fogs & cats. We lived in Kingsport for almost 29 years and then moved from the area, but still returned to Dr. Hyatt because of the care , knowledge, & compassion that our animals have received. We have moved again but still continue to bring our animals back to Dr. Hyatt and the excellent staff at CHAH. No one any better! I have two wonderful miniature dachshunds, Max and Sadie. Max has had a neck and back surgery and Sadie has had two back surgeries. Max is doing well but Sadie has some issues with her back. I began seeing Dr. Gray for acupuncture treatments for Sadie's back after her first surgery. I truly believe had it not been for Dr. Gray's care, Sadie would not be walking today. I can always see an improvement in Sadie after she has had an acupuncture treatment. I would highly recommend Dr. Gray. He has been a blessing for me and my furbabies. CHAH has taken care of all my pets since we moved here from California. I could not ask for any better care than what they give. The doctors and the staff are a very special people and we are very thankful. We've been going to Colonial Heights Animal Hospital since Sasha was 6 months old. She is now a senior dog and we have had nothing but good experiences there. From the time our big ol' girl got bit by a cat, to the time she had a run-in with a possum and scared me to death.. Dr. Height and the other staff have always showed great care and love toward our girl. Even calling after hours to check on her. That meant a great deal to me. I had a dog who was having problems eating and breathing. Dr. Hyatt recommended we go to UT Hospital in Knoxville. He also recommended a Doctor there to see. Unfortunately the news wasn't good. The tumor could not be removed because it was on his heart. They said they can relieve him to breath again but this cancer would take his life in a matter of 3 to 6 months. I wasn't ready to let go so we did whatever we could to give him some time for me to spoil him more (yeah right he was spoiled like crazy. I got worried one day and called Dr. Hyatt. He actually did a home visit to check on him. Sad to say my baby did go to heaven 8 months later. I noticed his kidneys were failing and he would not eat or take his meds. I couldn't let him suffer I had to let him go to rainbow heaven. Their staff is great and caring so are the Drs. Would like to say "THANK YOU" to all the staff and doctors, you are always nice and helpful. My story started back in 1972, I was a young boy, who had received his 1st dog. We named him Lightning. He was a Collie puppy. 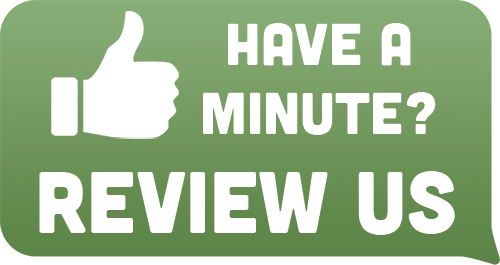 We brought him to your clinic for his 1st check up and continued to use your services for him. We both grew up together, he was my best friend, in 1984 we had to have him put down. I have had 5 other dogs since then Smokey, Rocky, Apollo, Bandit and Thunder. They have all been under you and your staffs care and every time you and your staff have been very loving, tender and uplifting thru times of regular visits to the difficult times of putting them put to sleep. Your services are greatly appreciated, your loving customers of 42 years, Mark and Melissa Phillips and any dogs they may be blessed with. They have always cared so much for my animal family members. My Boxer, Duke was my best friend for almost 13 years if it were not for Dr. Hyatt saving his life with the great help of the people of UT in Knoxville. He passed many years ago but he did live a very long life after his surgery. Now I have a new baby, a tea cup Yorkie. They are great with her and I wouldn't trust anyone else with my baby! Awesome, 5-star facility! The staff is so personable and kind. Always there, no matter how long it takes to help give advice and answer questions. They know my dogs and genuinely love and care for them. I wouldn't take my baby girls anywhere else. Kind, caring staff who are willing to share their knowledge and expertise while tending to your family pets medical needs. Great place. Wonderful staff. They are number one!!! Wonderful vets, compassionate staff! Couldn't ask for better care for my four-legged kids!